Today’s NYC executives, high-profile individuals, and celebrities, are faced with unprecedented corporate and personal risks requiring a higher level of security planning, coordination and management. Providing unobtrusive but effective levels of protection while at work, home or during travel is paramount. 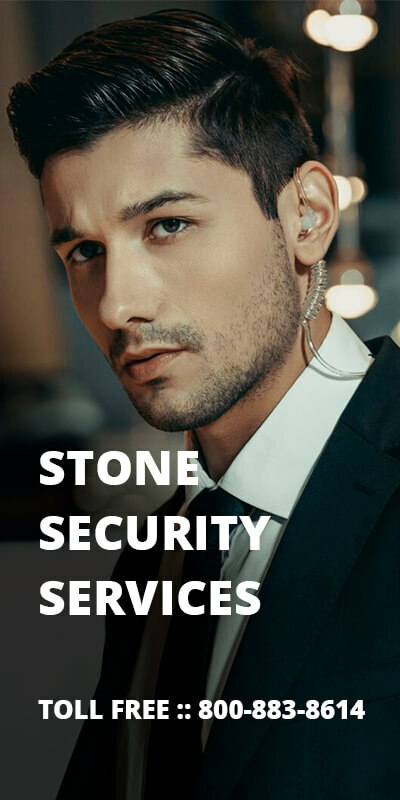 Stone Security Service in New York, offers a full range of discreet, personal and professional Executive Protection Services. Celebrity Security, and Bodyguard Services are designed to minimize risk while maximizing protection and mobility. Many NYC senior executives, business, dignitaries and celebrities are frequently under-protected in light of the critical value they bring to their organizations and the potential threats to which they inherently become exposed. Similarly, high-net worth individuals often do not fully recognize that their wealth and prominence may expose them and their families as potential targets for criminal acts such as kidnapping, extortion and robbery. The sophistication and determination of potential adversaries who would exploit such exposures of these persons, their organizations or their families is unprecedented. Despite such concerns, many executives, celebrities, and high-net worth individuals are reluctant to engage personal protection services because they want to retain privacy and a lifestyle of free movement. The need for executives and high-net worth individuals to move swiftly and securely throughout today’s business arena often overburdens the capabilities and resources of most corporate security departments. Stone Security implements customized executive protection planning to establish the optimal level of security for the individual at home, at work and while on travel or in public. Stone New York Security Services operational and management security teams are strategically drawn from the prime divisions of the New York City Police Department, and the United States Secret Service. Stone Security Services provides discreet confidential celebrity Bodyguard Protection Services. We also provide Special Event Security Services; Executive Protection for Dignitaries, Diplomats and Corporate Executives. Stone New York Security Services focuses on the needs of clients in both professional and private settings. Whether on a short-term consultation or a long-term protection assignment, our integrated and highly discreet approach enables us to build client relationships that last. An extensive network of professional affiliations extends our capabilities nationally and internationally. operational and management security teams are strategically drawn from the prime divisions of the New York City Police Department, and the United States Secret Service.